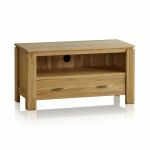 The Galway Natural Solid Oak TV Cabinet is one of our most popular TV storage cabinets due to its simple yet highly effective design. 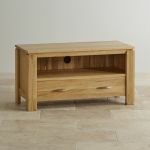 Handcrafted by skilled cabinetmakers from the finest cuts of solid oak, it offers a deep shelving area for any entertainment appliances with a bespoke exit in the back for the cables. 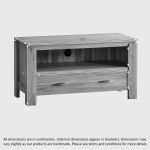 Beneath sits a generously-sized drawer, which is extremely handy for decluttering your living room or organising your DVD, CD and game collection. 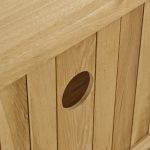 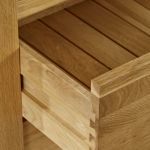 The drawer is crafted using traditional dovetail joints and solid oak linings - because we never skimp on materials and we never use chipboard, MDF or veneers in any of our products. Other quality touches include a raised tabletop, inlaid panelled sides and contemporary brushed metal handles. 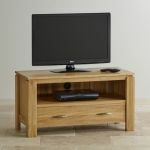 For extra durability and a gorgeous sheen, the TV Stand is finished with furniture wax.